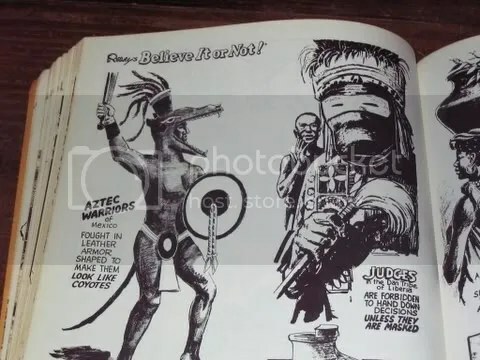 First, I gotta say I love this book–it was published in 1979, smells like an attic, and has hand-drawn pictures of Aztec warriors in coyote suits. I found this gem in a store quaintly called “The Book Nook” with shelves that go to the ceiling. 1. Crocodile Hunters in Papau capture the ferocious monsters by diving beneath them and tickling their stomachs. Results: Not much here. Found a manual on managing resources and crocodile farming in the tropics. No mention of tickling. 2. Children of Penrhyn Island in the Pacific, paddle to school everyday in wooden bathtubs. Results: I consulted with Wikipedia and “Jane’s Cook Islands Page”. Wikipedia claims the men leave the island in tin boats in search of food. So maybe… But then Jane says the schools are in the village. 3. Contradictory Cat: Kitten with “OK” on one side and “NO” on the other–both natural markings. 4. The Ring That Was Returned By a Fish: Madame Eduigue Rereit, of Paris, France, lost her ring down the drain while working in her kitchen and recovered it a few days later from a fish she had bought in the public market. Results: Easily debunked. As it turns out, The Fish and the Ring is an old English fairytale and has similar stories found in the folklore of many other cultures. 5. Fences in the Faroes Islands, Denmark, are still made from the skulls of dolphins. Results: I may have been the first person to google “fences made of dolphin skulls.” I did not find any fences though. 6. Sandy, a Collie has chewed 6 packs of gum every day for 5 years. Results: Disturbingly, there are 174 videos of dogs chewing gum on YouTube. Clearly, it’s a genre, as well as a thing people do to their pets. This one’s plausible, I guess. 7. A Raw Egg Balanced Vertically on its points between the blades of 2 steel knives will always rotate. Results: Nothing on Google, but now that I re-read the factoid, it says the egg rotates, not spins. Whoopty-do. I did however find this. Listen to how fascinated these people are by this spinning top thing they have. I mean, they video taped it. 8. The Hairy Frogs of the French Congo have hips and thighs covered in hair an inch long. As Kevin McCallister would say…. SICK. 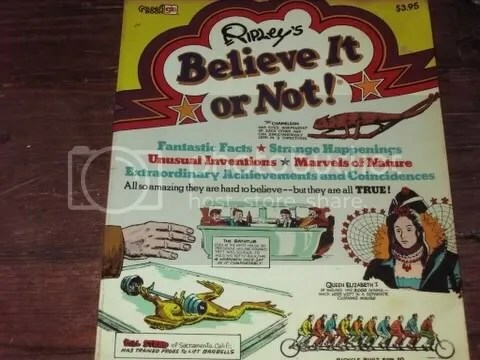 Believe It or Not!!! A little boy wrote a letter to Mr. Ripley, with a drawing of his dog. He explained the amazing facts that the beagle ate shards of glass and other sharp objects, with no apparent harm to him. Ripley published the drawing and the story. The boy was a very young Charles Schulz, decades later the creator of the comic strip Peanuts, and the beagle was the inspiration of the dog Snoopy. This appearance in Believe It Or Not!! was the very first time Schulz’s art work was published in comic pages worldwide.